There is an old saying “One person’s trash is another person’s treasure” …. what if that treasure was a bone fragment of one of the first Popes? Back in May a London waste firm comes across a relic of Pope St. Clement I in amongst some trash it was processing. The relic ended up quite literally ‘on the heap’ as one of a number of items stolen from a car. Obviously the thief in question was not an historian, nor a ‘good Catholic’, else the 2,000 year old relic would not have been found by workers of Enviro Waste. Pope St. Clement I was Bishop of Rome from A.D. 88 until A.D. 99. The early writers Irenaeus and Tertullian speak of Clement and his consecration as Bishop by St. Peter himself. Legend has that his papacy ended in exile under the Emperor Trajan. He died in 101 A.D. when he was tied to the anchor of a boat and thrown overboard. St. Clement I is considered to be the first of the Apostolic Fathers i.e. the first immediate successor of an actual Apostle of Christ. He is named in the Roman Canon (Eucharistic Prayer I) of the Church. By the grace of God this treasure of the Church was found and Environ Waste searched for a fitting home for the relic of the early Pope. After a month of deliberations the waste company, with the permission of the original (anonymous) owner of the relic, passed the treasure to The Treasures of Westminster Cathedral Exhibition, where it is now on permanent loan and in safe keeping. The bone fragment is encased in a wax-sealed case and includes an inscription that it is “from the bones of St. Clement, Pope and Martyr.” attesting to its authenticity. 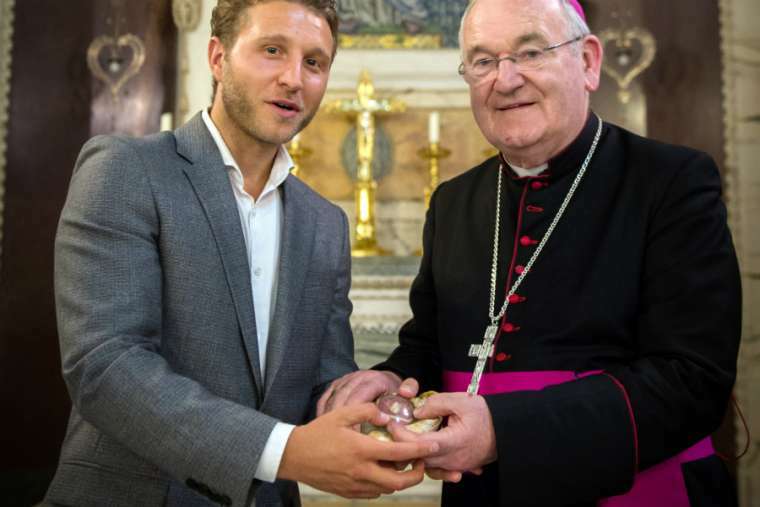 The relic was presented to the cathedral by Mr. James Rubin of Environ Waste and was received by our own Archbishop George Stack who serves as the chair of the Patrimony Committee of the Bishops’ Conference of England and Wales. The Patrimony Committee seeks “to encourage the appreciation, care and enhancement of the patrimony of the Church in its sacredness and beauty and to see this as a revelation of God’s love, as an expression of faith and worship and as a resource for the vitality and continuation of the Church’s mission” (CBCEW). The relic will be on display at the Treasurers of Westminster Cathedral Exhibition, which is available to visit by the general public. A gallery of images from the return of the relic is available from the Bishops’ Conference website here. Listen to the press briefing that Archbishop George took part in.